So Hollywood tries to tackle the issue of '60s south segregation, yet again, and yet again only gives us a glossy, inspiring, positive-outlook view. Yes there are so called “hard moments” and who knows, maybe someone in the audience might even shed a tear. Nevertheless, this is still a blond white girl’s story of how she rose to literary fame by telling black folks’ stories. I don’t know, maybe this can indeed function as some inspirational look back for black kids and “lessons learned” fare for white kids that otherwise wouldn’t look twice at the subject. maybe. and maybe not. maybe the long-lasting effects of slavery and segregation can’t possibly be summed up in a colourful southern tale with sassy black ladies and mean white women. I’m not one to tell. This definitely ain’t this year’s “Precious” that’s for sure, and it sure as hell ain’t anywhere close to Dogville or Manderlay (both of which starred a pretty white girl, curiously one that is also in The Help in Bryce Dallas Howard’s case, in the lead, but despite being written and directed by a Dane, still managed to be more poignant and relevant to the issue than The Help). 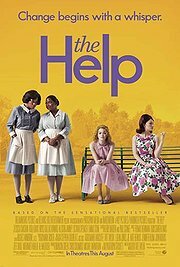 I suppose it’s unfair to compare, as in the end, The Help is a well-made movie, targeting a certain genre, demographic and style, but one can’t help but wonder how different it could have been if it didn’t look so much like those Stepford Wivesque scenes from Edward Scissorhands. Overall, this can function well as the perpetuation or perhaps the thing that keeps the mythos of '60s segregation alive. After all, forgetting about it all together is still worse than remembering it in a nicely consumable format. Overall, good but not great. Definitely a must if you enjoyed the novel.